If criticism is an act of translation—and I think it is—then reviewing the excellent 8.25-hour-long Chinese documentary "Dead Souls" is a bit like writing Cliffs Notes for a doorstopper history of the Chinese Communist Party's anti-Rightist purge of 1957-1958 (during which time: anybody who was thought to be against the Party could be forced to work, and many cases, die in farm camps). Still, here we are, and there is "Dead Souls": a massive, imposing work of non-fiction filmmaking that demands attention despite also being the sort of artwork that doesn't really need any of our attention to be great. Like a monolith, this thing just is. It also just happens to be great, sometimes despite and sometimes because of its mega-sized breadth and scope. So if you're thinking about watching or even reading about this movie, you should know that there's a fair chance that it will crush you like a bug and you'll have nobody but yourself to blame. Still, "Dead Souls" is one of the year's best films, whether you enjoy it or not (it may even be the year's best). That's not exactly a recommendation, but it's as close as I can get to one while writing about a movie that that's this, well, big. You might be wondering: what's it like to watch "Dead Souls?" It's mostly comprised of long, unbroken takes. Director Bing Wang deliberately rarely (and tellingly) cuts or breaks a scene up when interview subjects (mostly survivors of the farm camps) occasionally interrupt each other, or when outside noises intrude from off-screen. Still, many of the most enlightening scenes in "Dead Souls" are interview testimonials from thoughtful older subjects, all of whom are allowed to take their time in responding to Wang's infrequent questions. These interview scenes are often shot in flat, but wide camera angles that visually place interviewees within their home or defining environments (often their apartment homes, but sometimes a factory, a courtyard, a hillside, etc. ), but in an unpolished way that announces its DIY nature as part of Wang's ongoing "personal" (his choice of word) project. Your eye (and your mind) will wander at more than one point as you watch "Dead Souls." I don't think that's something that Wang planned for, but it is something that will probably happen anyway. But wait, who did you say made this thing and why is it so long? Well, that's a bit of a loaded question. Director Wang makes movies whose elephantine duration seems to reflect his understanding of how his complicated working-class subjects' talk and live. But while he's said in interviews that moviegoers/critics should not look too much into his work's metaphorical meaning, he clearly does not make films that can easily be used as mirrors by his subjects. Wang's movies are open-ended cinematic collages, much like the films of American documentarian Frederick Wiseman. They capture a certain quality and therefore speak for (and often quite well about) the issues faced by their economically disadvantaged subjects. But documentaries like "Dead Souls" are essentially for upper middle-class moviegoers who are hopefully implicated just as much as they are informed by Wang's anti-institutional narratives. These movies show you how economic and political systems are primarily supported: through punishing, alienating labor that effectively wipes out and/or diminishes individual workers' personalities and beliefs. Still, based on the evidence of films like "Dead Souls" (and "Bitter Money," a great 2.5-hour Wang-helmed doc released earlier this year), it seems that Wang knows (on some level) that his subjects are neither from the same economic class as his viewers, nor are they a monolithic entity defined exclusively by their respective bank balances. His subjects are each unhappy in their own ways, and that makes his movies—and their knowingly complicating views of post-industrial Chinese life—that much more challenging. But how do you get into "Dead Souls"? With some effort, though obviously not the same amount of effort it takes to, say, push an overburdened funeral cart carrying a massive, full coffin up a steep hill and into a newly-dug grave (as we see in an early scene at about the 45-minute mark). There's some background noise partway through this scene; it could either be the sound of fireworks exploding or the loud groans of a coffin as it's being lowered into the ground. Either way: what you see is what you feel is what you get. So if you can't force your way in (or intuitively get in) to the beginning of this scene, you probably won't be able to get into "Dead Souls." But if you tough it out for a few minutes, Wang's subjects start to look more and more like the fully-formed characters that he basically treats them as. 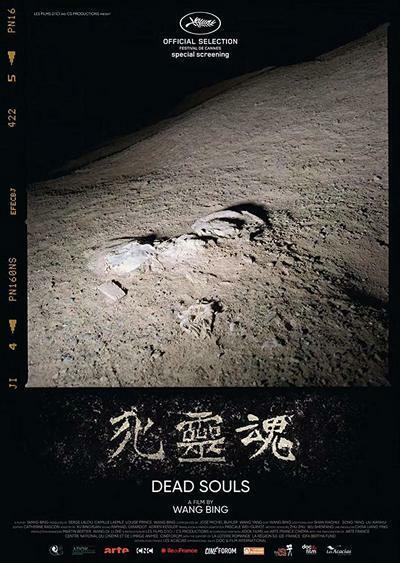 One mourner (Yanlin, the eldest son of Zhinan, the deceased) wails and tries to jump into the open grave while two grave-digging volunteers struggle to push the dead man's casket into a hole within the grave. "You can't behave like this," another mourner says to Yanlin, still above-ground. But in time: Yanlin does slide into his dead father's grave and does try to get into the densely packed subterranean hole within the grave, the one that now houses his dad's casket. "Call the fengshui master to calm the situation," says a worried mourner, this one trying in vain to keep Yanlin out of the mini-grave within the grave. Here's a pearl of drama and human interest that viewers will find at the heart of almost every scene in "Dead Souls." You just have to be willing to let Wang do a fair amount of digging before he shows you something worth writing home about.